Want to DIY an ORP meter? Need to measure the ORP value? Find it difficult to use with Arduino? 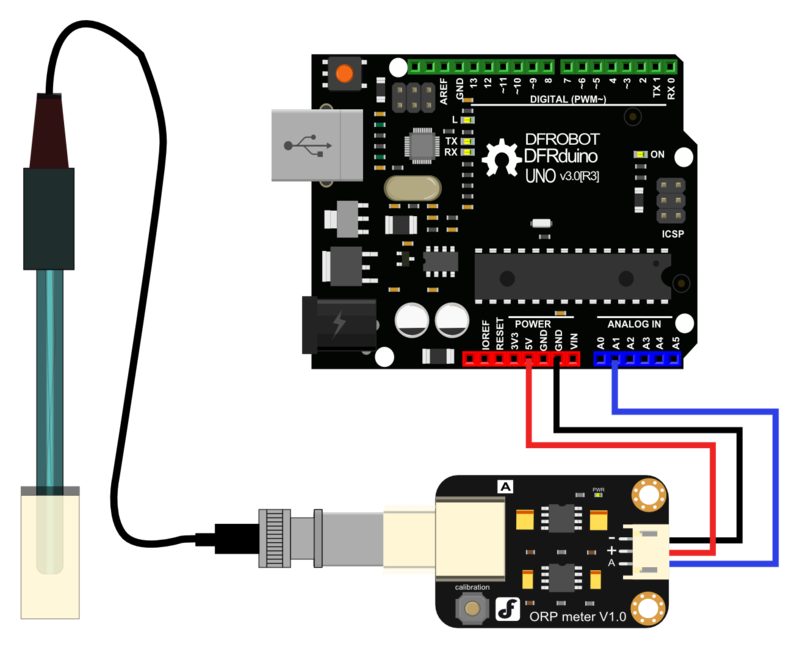 Here comes an analog ORP meter,specially designed for Arduino controllers and has built-in simple, convenient and practical connection and features.When done the connection according to the diagram ,then with the program control,it's very convenient to measure the ORP. ORP(Oxidation-Reduction Potential)is a measure of the ability of oxidation and reduction of aqueous solution, characterization of the relative degree of oxidizing or reducing.The unit is mV. Oxidation reduction potential is high, oxidation is stronger ,while the potential is lower, oxidation is weaker. The positive potential means that solution shows a certain degree of oxidation, while the negative potential means that solution shows a certain degree of reduction. ORP is an important index of water quality detection, although it can not separate water quality independently, but can be combined with other water quality index to reflect the ecological environment in the aquarium system. The measuring element is an ORP composite electrode, made of gold or platinum electrode and the reference electrode,assembly into a composite electrode.It used to measure Oxidation-Reduction Potential of the solution. Please use an external switching power supply,and the voltage as close as possible to the +5.00V. More accurate the voltage, more higher the accuracy! Using the ORP electrode is without calibration, so it can be used directly. Only when you doubt the ORP electrode quality or test results , you should use the ORP standard solution to check the electrode potential to determine the ORP electrode or instrument quality. Before the ORP electrode measured different solutions, we need to wash it,and deionized water is recommended. When the ORP probe is connected to the ORP meter board,please do not press the calibration button.Or,the ORP probe may be damaged! Use the analog connection lines,the ORP meter board is connected to the analog port 1 of the Arduino controller. When the Arduino controller gets power,you will see the blue LED on board is on. Upload the sample code to the Arduino controller. (Note: At this time,a sentence in the sample program should be "#define OFFSET 0"). Open the serial monitor of Arduino IDE , you will see the current ORP value.Press the calibration button and keep it pressed,you will see a small ORP vlaue printed on the serial monitor.Then according to this value, modify the offset in the sample program.For example,the serial print: "ORP: 8mV", then you should modify the sentence "#define OFFSET 0" to "#define OFFSET 8" in the sample code,then recompile the code and upload. At this time,you have completed the calibration. 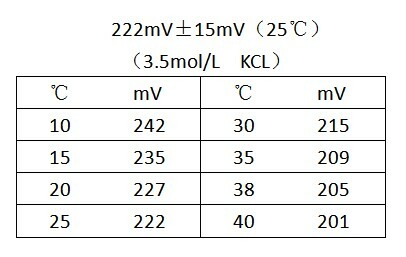 According to the graphic,the ORP electrode is connected to the BNC connector on the pH meter board.. After the calibration, the ORP electrode can measure the ORP value of the solution, through the serial monitor, you can see the current ORP value of the solution conveniently. Sample code for testing the ORP meter and get the sensor feedback from the Arduino Serial Monitor. # This sample codes is for testing the ORP meter V1.0. Before and after measurement, it is necessary to use deionized water to wash the electrode, in order to ensure the measurement precision. When measured in thick samples, you should wash the electrode with hot deionized water repeatedly rinsed several times, to remove sticky in the platinum sheet specimen. It will occur the passivation when the electrode has been used for a long time.The phenomenon is sensitive gradient decreasing, slow response, reading data is not accurate. At this time,you should immerse the bottom electrode platinum sheet into 0.1M hydrochloric acid for 24 hours. Electrode pollution or the liquid junction jam also can make the electrode passivation. At this time,you should select the appropriate cleaning solution based on the nature of the pollutant. The electrode using cycle is about one year. After aging, it should be replaced with a new electrode in a timely manner. Get Gravity: Analog ORP Sensor Meter For Arduino from DFRobot Store or DFRobot Distributor.